As important and iconic as anything in our hobby. This card represents the very finest in sportscard investments and stands among the best PSA 8s to be auctioned in recent times. A completely fresh and wonderfully preserved example which boasts excellent centering and bright white borders for the issue. Rarely is the print and focus this strong on the issue. 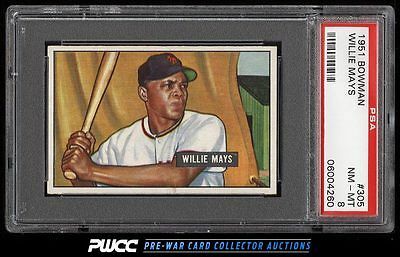 We love the '51 Mays RC for obvious reasons but we are especially enamored with this particular example. Fully worthy of the grade and merits serious consideration. Enjoy! One of nearly 20,000 cards, lots, and sets up for bid in our 7th Auction of 2016. Click on the link above to view the other PWCC auction lots.